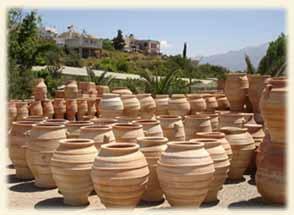 Volyrakis family, having been experienced in ceramics art for 150 years, maintains and keeps going the cultural tradition , combines the traditional art with the modern production methods using the unique Cretan raw materials and has managed to create high quality goods ,fully guaranteed for its customers . The traditional Volyrakis ceramics are all hand-made and are burnt in a traditional wood-kiln which guarantees quality, durability and unique colouring. Volyrakis family exports its products to numerous countries and is committed to the very best cooperation with its customers.